Colorado winters rule for the mountain-biking obsessed. Choose these three snow biking spots to keep spinning all season. For dedicated riders, winter is the perfect time to pull out the fat bike, with its rigid frame and Michelin Man tires that float over packed snow. The sport has become so popular that some areas have created networks of dedicated fat bike trails that can keep a rider exploring for a few days. Pack your bikes and your bags—and go big. Leadville locals have been riding and racing bikes in the snow for nearly two decades. The Mineral Belt is a 11.6-mile paved gem that is groomed for fat biking and cross-country skiing in the winter. The climbs are gentle, offering spectacular views of the Sawatch and Mosquito ranges as well as glimpses into Leadville’s rich and colorful mining history. From the Mineral Belt, riders can connect with the Colorado Mountain College campus to access a trail network meticulously groomed for fat bikes. The trails playfully undulate through the woods, weaving around the trees. 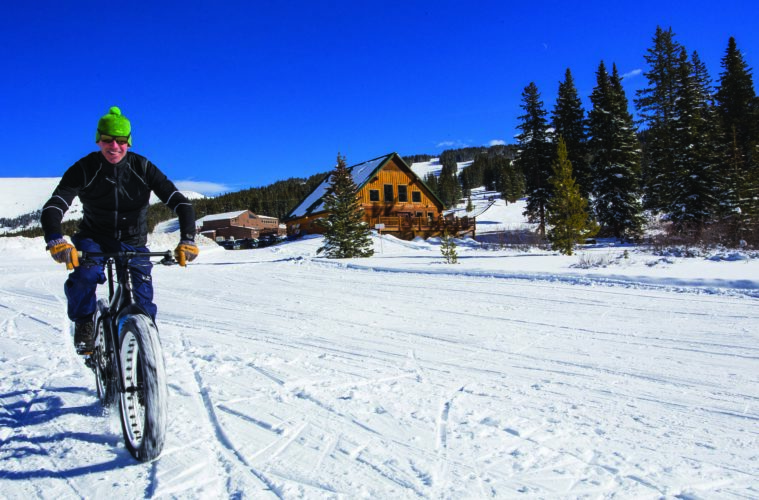 For a second day of riding, check out either the Tennessee Pass Nordic Center, boasting more than 25 kilometers of groomed trails and winter singletrack, or take in the mountain views with a 14-mile loop around the frozen Turquoise Lake. A quiet underdog on the Colorado mountain biking scene, the Glenwood Springs area tends to surprise visiting riders with its challenging singletrack and lovely forested landscape. After skiing a few runs at Sunlight Mountain Resort, located 30 minutes outside Glenwood Springs, fat bikers should head up Old Four Mile road to access Babbish Gulch, a quiet, 29-kilometer network of multiuse backcountry trails. The area features extended climbs into a high valley, with several fun, open downhill options. On day two, take a morning spin on the trails at Wulfsohn Mountain Park, located just off I-70. During the summer, these shorter, intermediate trails are somewhat tame, but they make great, entertaining riding when snow-covered. Afterward, unwind with a soak in the pools at nearby Iron Mountain Hot Springs. Crested Butte’s winter riding options, maintained and groomed by several organizations, are nearly on par with its legendary summer network. It’s even home to the Fat Bike World Championships in January. Start from Snodgrass Trailhead, where you can choose from an out-and-back climb and descent on the road or pedal a short way toward Gothic Road to access the North Village. This fat-bike wonderland features 3.5 miles of rollercoaster terrain, berms and features. On day two, climb up Gothic Road to a famous ghost town for a seven-mile out-and-back ride. Alternatively, ski for the day, then check out the Crested Butte Mountain’s excellent fat-bike specific trails after the lifts close.